To look like a million bucks on your or your friend’s wedding is every damsel’s dream. But it’s a worthy affair only if you are wise enough to select a designer bridal lehenga that complements your personality. Else, the whole look will be disastrous. 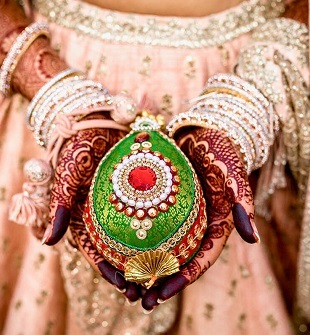 To-be-brides are breaking norms by choosing off-beat colours for their bridal lehenga designs. As wedding season is peaking around the corner – the shopping hunt is on, with brides continuously fretting over the designs or sometimes the fittings or last-minute alterations in their blouses. Yesteryear’s lehengas were of the conventional types, with a blouse known as ‘choli’ and the flared skirt-type known as ‘Ghagra’. But today with ample of designers experimenting with fabrics, colours, patterns – one has enough freedom to customize their own bridal lehenga designs. The type of wedding lehenga choli and the palette of colours you intend to fuse on it – merely depends on whether you are a ‘morning bride’ or an ‘evening bride’ and if it is an ‘indoor wedding’ or an ‘outdoor wedding’. 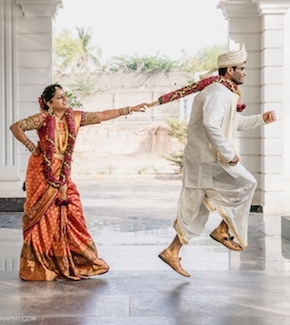 Knowing on which session of the wedding occasion you are going to dress up matters a lot! With the temperature soaring high this wedding season and with improper grooming – you might end up looking irritated in all your photo shoots. It’s better to choose soft, flowing fabrics like satin, crepe, chiffon or net. You can also opt for sheer silk and organzas over heavy brocades. Choosing such soft fabrics will help you easily manage besides giving a carefree look. Today’s modern brides want to look trendy yet unconventional. Hence, they are choosing light silhouettes over darker ones. You can break norms by going on with colours like icy cool shade, strawberry ice, custard, toasted almond and other pastel shades. There will be ample of daylight since the wedding occasion is going to be held in the morning. Thus to complement the daylight background, earthy and light shades of lehenga would look cool instead of red, mauve and bright colours. Go minimal with jewellery and makeup as too much of it will make you look cakey in this hot climate. A neat bun with flowers adorning it can help you nail the look of a gorgeous morning bride. When it’s morning and the show is all yours! With all eyes of the onlookers on you – an ethnic kamarbandh and a beautiful anklet will definitely make you steal the show. Evenings are normally meant to be cool and romantic. 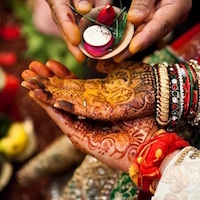 You may be asked to attend your friend’s Mehendi or reception, as these functions are normally held in the evening. Confused and perplexed you might be! There are always better ways to fuse in your signature lehenga style with ease. Try choosing colours like tangy orange, bright green, peppy blue for an evening soiree. Evening moods are always dull and hence it’s better to choose some masala colours. You might go sultry with blouse designs or your lehenga drape. If you are a bride’s sister or friend – a beautiful shimmer netted high-waisted lehenga with a corset or a neat boat-neck top would give you a chic yet modest look. A winged eye-liner, peach blush and lipstick complementing your wedding attire will make you look simple yet elegant. Going gaudy or minimalistic depends on how you want to groom yourself. Sometimes just a wavy hairstyle updo, winged eyeliner and bright red lipstick steals the game. Hope, this blog has helped you in keeping your silly confusions at bay. As myriads of designs with trending collections are available online – make the best use of it. Silhouette bridal lehengas with price are available in designer boutique houses and in online portals. You might also sometimes get customized or just order online and then stitch it as per your interests. As small matters can make or break in making you look either like a showstopper or like a runaway bride! The ball is now in your court. So, try making wise decisions by wearing these amazing designer bridal lehenga and taking cues from small designers, boutique houses, magazines and trending online blogs on fashion.